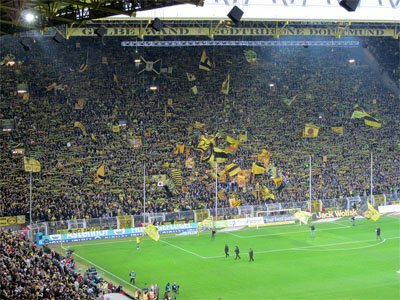 Purely looking at the numbers, Borussia Dortmund is the most popular football club in Europe; the club has the highest average attendance. And with eight national titles, three DFB-Pokals, a Cup Winners' Cup and a Champions League, not many would argue against Dortmund belonging to Germany's football elite. The club is often mention with the abbreviated BvB, which standing for Ballspielverein Borussia or in English "Borussia club for ball games" (the club also has a women's handball and a men's table-tennis teams). The full name is BV Borussia 1909 EV Dortmund. The fans on the Westfalenstadion. Dortmund was founded in 1909, by a group of eighteen youths unhappy with the local chaplain's treatment of their church-sponsored football team. Being a relatively small club, Dortmund's ambitions were moderate to start with. The club barely avoided bankruptcy in 1929, and being an anti-Nazi oriented club during the Third Reich regime certainly didn't help matters. Their first taste of silverware came in the mid-50s, with two consecutive national titles in 1956 and 1957. Having proved themselves by winning the last German national championship ever held (1963), Dortmund were among the sixteen clubs invited to play in the newly-formed Bundesliga. In general, the 60s were a fruitful period for the club, which claimed its first DFB-Pokal in 1965 and its first and only Cup Winners' Cup the following year. This would be their last trophy for a while, as the next three decades were fraught with continual financial troubles. Even with the club winning its second DFB-Pokal in 1989, the future wasn't looking too bright. Their fortunes would finally change with the hiring of Ottmar Hitzfeld in 1992; with the genius strategist in charge, Dortmund soared to the top of German football. After winning two consecutive Bundesliga titles in 1995 and 1996, Dortmund set off to conquer the rest of Europe. In 1997, they advanced to the Champions League finals, where they handily defeated the favored Juventus 3-1. The loss of Hitzfeld to Bayern Munich after the Champions League victory was a tough pill to swallow, but their financial troubles would prove an even greater hindrance. After Dortmund became the only German football club to enter the stock market at the turn of the millennium, their shares had started falling and the club found itself deeply in debt. The Bundesliga title in 2002 was not enough to turn the tide, and the club had to resort to selling their best players in order to survive. As a result of a sponsorship deal with an insurance company, Westfalenstadion would in 2005 change name to Signal Iduna Park for a limited time (until 2021). After a couple of miserable seasons, Jürgen Klopp's arrival in 2008 would set them back on the road to greatness. Under his leadership, Dortmund would prove to be the only true challenger to Bayern; their reignited rivalry was the main talking point of German football in the years that followed. During Klopp's seven years at the helm, Dortmund claimed two more Bundesliga titles (2011 and 2012) and their third DFB-Pokal (2012), but lost to Bayern in the 2013 Champions League final. The Borussia Dortmund logo is straightforward with the “BvB” initials standing for Ballspielverein Borussia and “09” standing for 1909, the year the club was established. In some older versions, a bird has been used instead of the letters and number in the crest. 1909 The Club is established. 1956 First German football championships title. 1963 First season in Bundesliga after being one of the teams invited. 1965 Winning their first DFB-Pokal. 1966First European Cup Winners' Cup title. 1974 The club move to the Westfalenstadion stadium. 1989 Winning their first DFL-Supercup. 1991 Ottmar Hitzfeld is appointed as manager. 1995 First time Bundesliga winner. 1997 First Champions League title. 2008 Jürgen Klopp is appointed as manager. 2012-13 Final Defeated by Bayern M.